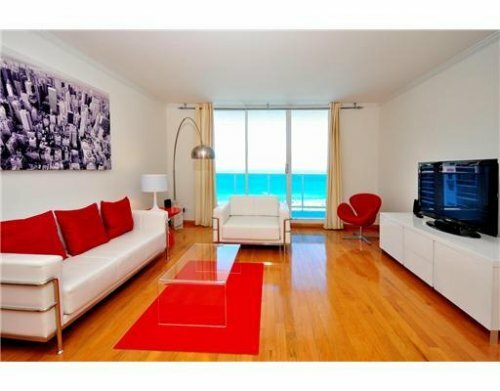 This large, 11th floor, 2 bedroom, 1 bath, corner suite at the Roney Palace faces directly east with unobstructed views of the blue waters and white sands of the Atlantic Ocean from every room! It boasts designer Italian furniture, a large balcony (closed Oct & Nov. for repairs), hardwood floors throughout, and includes everything you should need during your stay. The gourmet kitchen comes fully equipped also. Washers & Dryers are not in-suite but are located on the floor. No need for a car because you can walk or cab to everything. However, valet parking in the building is available. The Roney Palace is situated on 600 feet of stunning pristine beachfront. Our guests enjoy a private pool overlooking the ocean and Towel service is included at the pools. Also enjoy the service at the beautiful Roney/Perry Hotel Beach Club. Beginning in February our guests will enjoy access to the adjoining and newly remodeled Perry Hotel Pool Plaza, with outdoor poolside restaurant and bar, infinity pool overlooking the ocean. Located in the South Beach area of Miami Beach, the Roney is next door to the W Hotel (Set Night Club & Mr. Chow Restaurant) and a block from the Miami City Ballet, Bass Museum of Art, Miami Beach Library. Walking distance to the Miami Beach Convention Center, Botanical Garden, Jackie Gleason (Live Nation) Theatre, Frank Geary’s stunning New World Symphony and Soundscape Park and Ocean Drive. Nearby residents will find Lincoln Road shopping district, Miami Beach Golf Club, sport fishing, tennis courts, jet skis, windsurfing, scuba diving and all the restaurants and nightlife that South Beach as to offer.